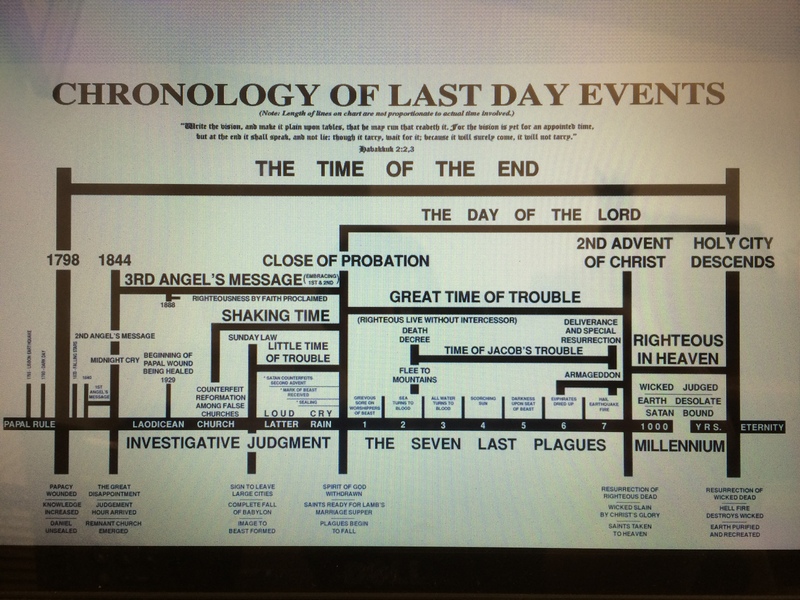 I had the privilege of presenting a Planet In Distress series at the Portsmouth Seventh-day Adventist Church in Portsmouth, New Hampshire this Friday and Sabbath, and I promised them that I would post the end-time chart that I use. Here it is! Thanks for the chart Scott. Yours is simply laid out and easy to read. One area that I would ask for clarification on is this; most Adventist end-time expositors teach that Sunday laws are to precede the commencement of the ‘little time of trouble’ EW 33. It seems apparent to me that Sunday laws will develop as a /result/ of increasing global troubles and at a certain time a trigger event or series of events will thrust the world into an attitude of high anxiety and desperation. And then religious political leaders will convince the public to accept their solution to appease the judgments of God by moral reform which will include the Trojan issue of Sunday laws. As I read the SOP and look back at and the past 140 years of Sunday law activity in the USA and Canada, it seems to me the everytime the Sunday law issue swells, secular opinion and leadership suppresses the momentum. This would be why recent papal and protestant efforts to sway the public towards Sunday legislation use the reasoning of family integrity and an over-worked society. On my chart I took the license to call the beginning of the ‘little time of trouble’ the beginning of the day of the Lord. I believe that once Adventists behold the undeniable fact that the Sunday Law issue has come and continues to build momentum and public support, the church will awake to the realization that /this is it,/ the time has come to get serious about our profession which will precipitate the loud cry, Satan’s impersonation, the shaking, the sealing, etc. I invite any candid comments that you might have about my conclusions as we both come to the best and accurate understanding of the scenario. Here is a link to my last recorded presentation along with the PPT slides. I am currently studying the books of Revelation and Daniel, currently in Revelation (in chapter two right now) and reading EGW, I am learning how the Sunday Law will come about. What troubles me is so many Adventists think something horrible will happen either in the States or in some other country that will set the ball rolling for a Sunday Law to be erected in our country. From what I understand, it seems to be the Sunday law can be set up right now wıthout much fanfare– from the status of the world economy to the murderous rage of ISIS can trigger the establishment of the Sunday Law. Therefore as time goes by, the regulations under that’s law goes from as simple as closing all shops on Sundays to forcing people to attend church on Sunday with a threat of prisonment if someone does not attend. What do you think? I am just not seeing how and why the Sunday law has to be setup just by one world-changing event. With that out of the way, it is good to be aware what time of day we are living in yet how easy it is to forget what our mission is! While we still have peace, may we go about our Father’s business. I can see I did not make one bit of sense! Basically my question is: “Does something major has to happen in order for US to set up the Sunday law”? Yet this very class put forth the claim that the fast-spreading corruption is largely attributable to the desecration of the so-called “Christian sabbath,” and that the enforcement of Sunday observance would greatly improve the morals of society. This claim is especially urged in America, where the doctrine of the true Sabbath has been most widely preached. Here the temperance work, one of the most prominent and important of moral reforms, is often combined with the Sunday movement, and the advocates of the latter represent themselves as laboring to promote the highest interest of society; and those who refuse to unite with them are denounced as the enemies of temperance and reform. I’ve just finished a sobering piece, :The Next Genocide” in the NYT by Yale history professor, Timothy Snyder. Although I don’t necessarily agree with everything said, it strongly reinforces the subjects covered in your writings, and illustrates the growing concerns, and fears, of a widening circle of folks. Seems the world is becoming ripened for some charismatic “savior” (demogogic) figure to appear. In response, Lord help us hold up, and reflect more perfectly His character for the sake of those souls around us in these increasingly stressful times. Should read, “Book: The Coming Climate Genocides”. Should read: “Book: The Coming Climate Genocides”. we can also supple an A3 laminated version, printed on both sides for £5. Please contact our ministry Voice in the Wilderness for more information.